The positive comments kept coming after Bob Colquhoun spoke at the Finding Light in the Darkness Mini-Retreat on April 29 at St. Thomas More Catholic Church in Coralville. Bob Colquhoun speaks at St. Thomas More-Coralville’s mini-retreat April 29. Colquhoun held nothing back in telling how far he had fallen from God. As a graduate of Washington High School in Cedar Rapids, Iowa, he was a celebrated varsity swimmer and musician, but he turned away from all that and gradually headed toward a sin-riddled life. His initiation into this world began with marijuana and a deep need to fit in with the “right” clique. After becoming the lead singer in a rock-and-roll band in Florida, he became heavily involved in the drug world as both an addict and dealer. Continuing with this lifestyle, he abandoned his family. He attempted suicide. He spiraled even deeper when in September 1995 he was arrested as a passenger in a stolen car, charged with theft, and sentenced. He spent the next 7 ½ years in an Arizona prison. 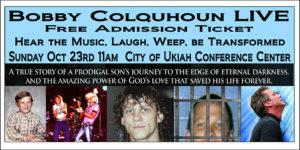 It was there that Colquhoun, of Marion, Iowa, turned his life around and began a “Prodigal Son” journey back to God. He attended and led Bible studies while incarcerated, finding the healing light of God’s love. Once released from prison, Bob eventually began a ministry of speaking and singing. (For more information, go to LiveGodNow.org).